Exciting news this week for fans of the films of Patrick McGoohan. 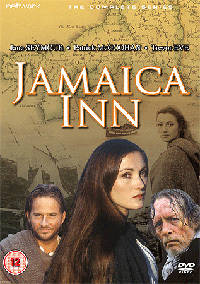 The first is that the 1980s movie, produced by "Prisoner" and "Danger Man" Director Peter Graham Scott and co-starring McGoohan and Jane Seymour, "Jamaica Inn" is geting a DVD release in May 2008 by Network DVD. Also available from a company called Intrada are limited edition soundrack CDs for some of McGoohan's films. They are Jerry Goldsmith's score for "Baby: Secret of the Lost Legend" (HERE), John Barry's for "Mary Queen of Scots" (HERE), and Henry Mancini's for "Silver Streak" (HERE). Thanks to Leslie Glen and Simon Coward for this news item.